I thought EURGBP was really gonna pop lower for a homerun and reel me in some pips, but it popped back up and hit my stop loss. I guess I should’ve set it wider, probably above the week’s opening price at 0.8315 where resistance held. In hindsight, taking a breakout trade on the EURGBP might not be a good idea, unless there’s a catalyst to cause the moves. Considering how both the euro and pound both traded higher yesterday, it’s no surprise that EURGBP stuck within a tight range. Despite the loss, I still think this was a decent trade idea. I just happened to trade the pair on a day when there wasn’t as big a move was we saw on Monday. It’s time to focus on trading better and executing well – in time, the profits will come. While I’ve still got my EURJPY position open, I’ve decided to take on a day trade on EURGBP. Technically, I like this setup for a couple of reasons. First, the pair dropped and just broke the .8300 handle – I really don’t think we’ll see the pair come back up. Secondly, it has been in a nice downtrend the past couple of weeks, as the pound has been pretty strong across the board. 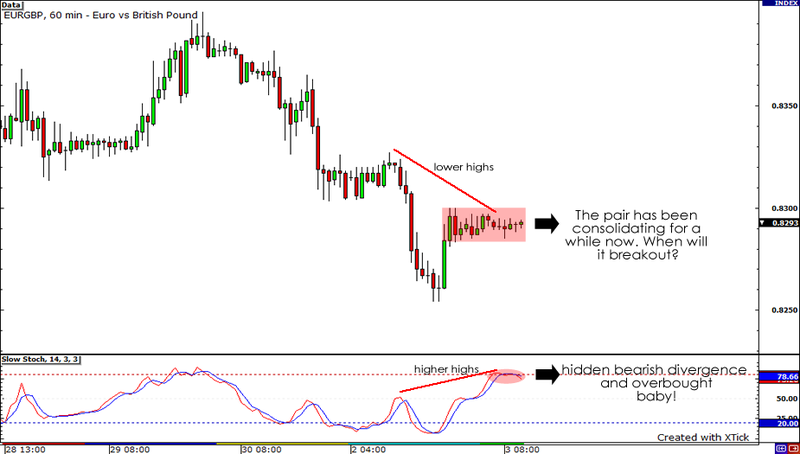 Thirdly, there appears to be some bearish divergence forming on the one hour chart. Notice how price has formed lower highs, while stochastics are showing higher highs. And lastly, and probably my favorite reason, the pair has been trading within a 15 pip range for the last how many hours! It’s bound to break out somewhere! Fundamentally, we’re seeing risk appetite dominate the trading landscape. Both the euro and pound have been killin’ it like Tom Brady, but so far, the pound has been pretty dang strong. 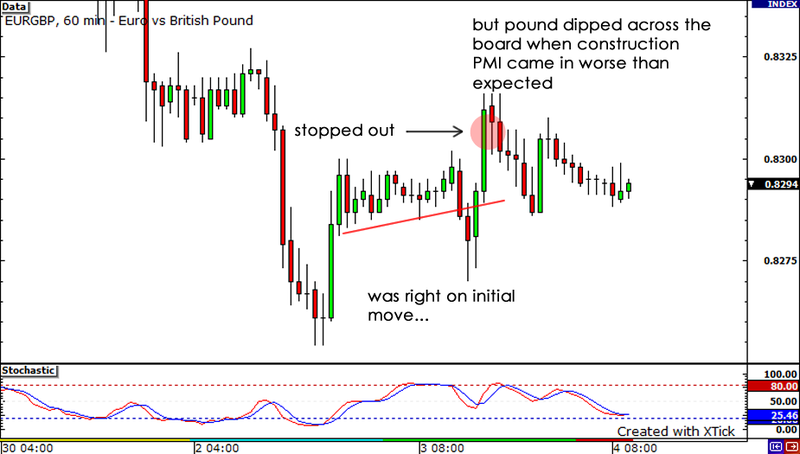 Look at yesterdays move – GBPUSD rose 177 pips! This signals to me that we may see pound strength continue. I’ll be looking out for the UK construction PMI and euro zone PPI reports, but I don’t think these will cause too much of a ruckus in the markets. As for the Nationwide consumer confidence report, I think we may just see an upside surprise, seeing as how everyone has reacted positively to the British goverment’s austerity plans. I’m looking to short below today’s low of .8385. I’ll be aiming for yesterday’s low at around .8250. I’ve set my stop above the .8300 handle. Since this is a day trade, I’ll be playing this during the European session only. Once I hit my first take profit point, I’ll move my stop to my entry point and let this sucker ride. I don’t see any line of support until the .8200 handle, so that’s going to be my touchdown zone! Short EURGBP at .8280, stop at .8305, take profit at .8250. So for now, I’ll be keeping my eyes glued to the charts and hopefully I can rake in some quick pips today. Thanks for reading my blog! You can also check out my past trades at MeetPips.com! Holla – peace out my friends!